Exodus from racist-heavy speakers' lineup for Lincoln Memorial rally Sunday fuels a rival alt-right protest at the White House, and the two sides engage in social media warfare over it. Tim 'Baked Alaska' Gionet posted a meme aimed at the 'alt light' rally. Although the alt-right presents itself as a new kind of white male nationalism rewired for the 21st century, it is proving in practice to have many of the same qualities as its old 20th-century forebears: Riddled with infighting and internecine quarrels, the product of a movement whose sociopathic agenda attracts similar personalities, ego-driven and contentious. The infighting, which first erupted last week between far-right Oath Keepers and white nationalist alt-righters, deepened this week when two factions — outright white nationalists and committed racists on one hand, and alt-righters (dismissed as the "alt-light") who disavow them and their politics while embracing the movement agenda — squared off on social media over a series of “free speech” events aimed at provoking left-wing counter-protests and, potentially violence. The result is that there will be two competing “free speech” events this Sunday in Washington, D.C.; one a “Rally Against Political Violence” hosted by alt-right provocateur Jack Posobiec, planned for noon at the White House; the other a “Freedom of Speech Rally” hosted by Colton Merwin at the Lincoln Memorial, and featuring such white nationalist figures as Richard Spencer, Nathan Damigo of Identity Evropa, far-right “neo-Pagan” Augustus Invictus, blogger Jason Kessler, and social-media celebrity Tim “Baked Alaska” Gionet. The White House rally will feature alt-right figures such as Laura Loomer (who recently made headlines by taking the stage during a performance of Julius Caesar in New York City), “Kekistan” fan Cassandra Fairbanks, and Kyle Prescott of the alt-right “fight club” Proud Boys. It apparently was organized by alt-right figure Mike Cernovich and Posobiec in response to the roster of speakers invited to the Lincoln Memorial rally; speakers such as Loomer (whose background included a stint as a writer for hate-group leader Pamela Geller’s Islamophobia operation) had originally been scheduled to speak there but then canceled. Jason Kessler posted a video demonstrating that Posobiec had plagiarized his work while he was employed at the Canadian alt-right website The Rebel; in response, Posobiec blocked him. 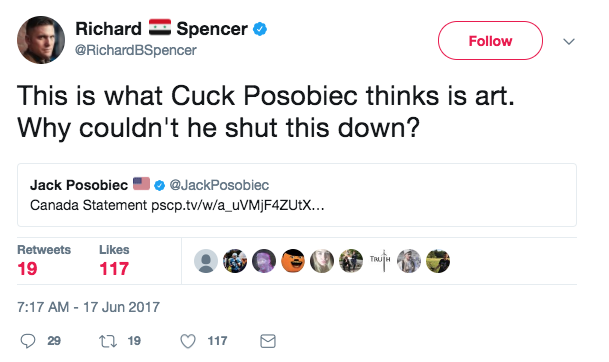 Posobiec also apparently blocked “Baked Alaska” for criticizing one of his media stunts. 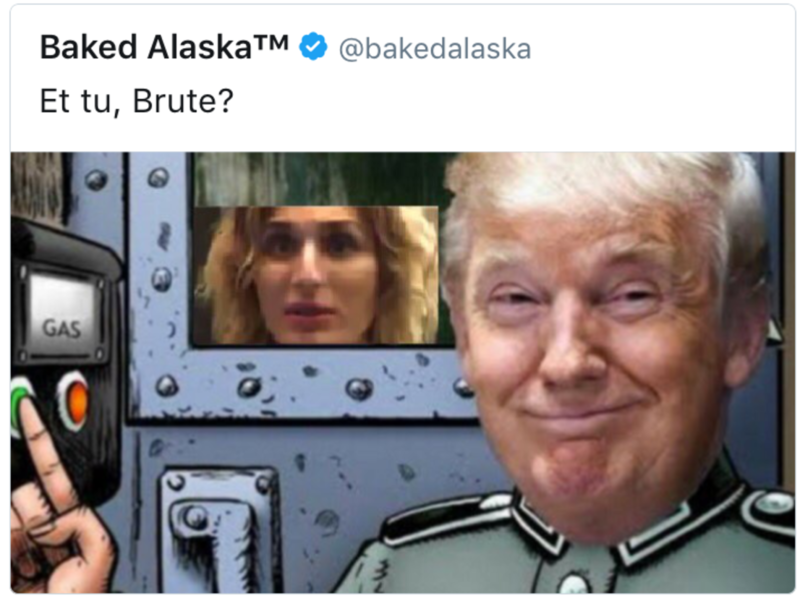 “Baked Alaska” also got into a Twitter war with Loomer after he posted a meme with her face Photoshopped into a gas chamber, outside which stood Donald Trump in a Nazi uniform, ready to pull the switch: “Et tu, brute?” it read. The poster for Kessler's Aug. 12 event. A similar feud threatened to break out over another “free speech” event, this one an Aug. 12 “Unite The Right” rally in Charlottesville, Va., organized by Kessler as part of his ongoing protest against the threatened removal of a Confederate monument to Gen. Robert E. Lee. 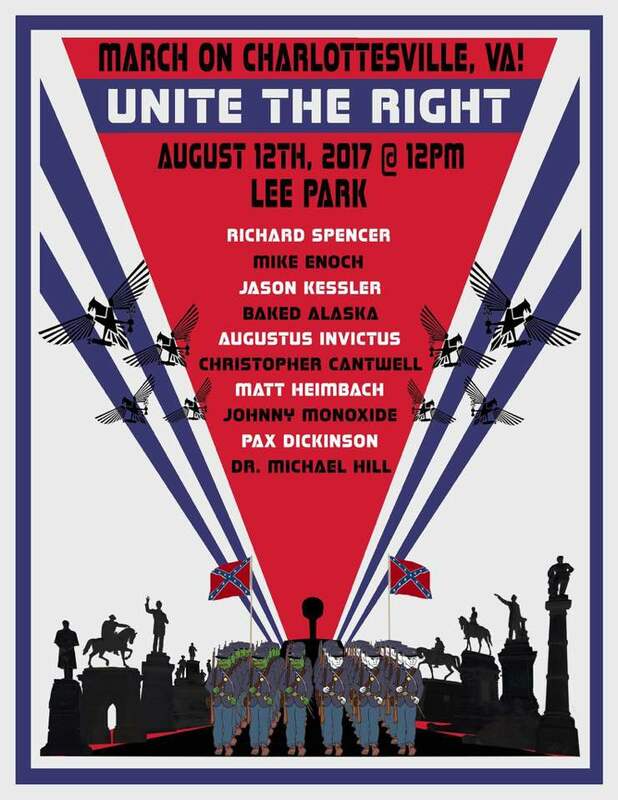 The lineup for that event includes Spencer, Augustus Invictus, white nationalist Matthew Heimbach, and League of the South president Michael Hill. “Infighting is part of every movement - but it doesn't have to be,” posted Augustus Invictus on his Facebook page, along with a poster for the event. In the meantime, another would-be participant posted: "Will the Oath Cucks be there?" It might be time to stock up on the popcorn.